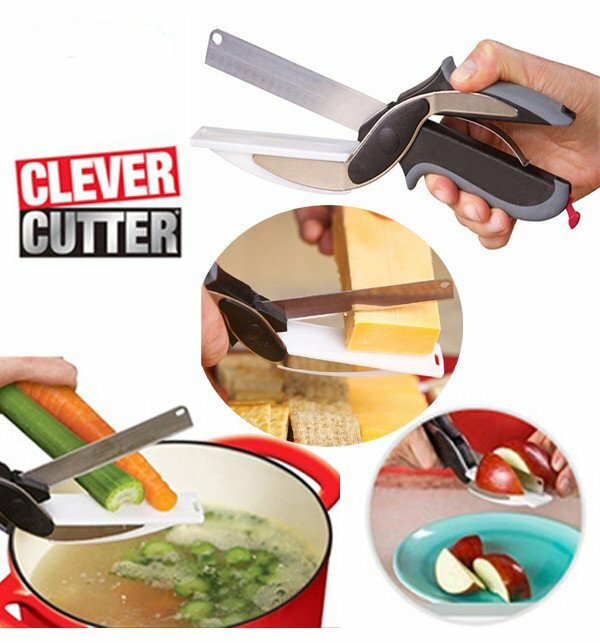 Be clever and use Clever Cutter 2 in 1 Knife & Cutting Board, it is an innovative way of cutting, chopping and slicing vegetable and fruits in your kitchen, the knife resemble designed is made up of stainless steel and plastic. It has a blade at the top and mini cutting board at the bottom which helps to cut similar like traditional cutting broads at kitchen. Order Clever Cutter 2 in 1 Knife & Cutting Board online at Shoprex.com with free home delivery. Type your comments ... These products are good and sasty hain. You are looking now latest Clever Cutter 2 in 1 Knife & Cutting Board price in pakistan market 2017 including in all major cities, Clever Cutter 2 in 1 Knife & Cutting Board Price in Karachi, Clever Cutter 2 in 1 Knife & Cutting Board price in Lahore, Islamabad, Faislabad, Pesahwer, Quetta, Multan, Rawalpindi and many more cities.